The University of New Brunswick will now be positioned to better understand and potentially improve concrete—the most commonly used building material in the world—after today’s gift announcement from the Acker family. 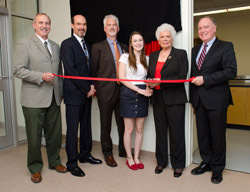 UNB has opened the Sydney E. Acker Concrete and Masonry Laboratory on its Fredericton campus today, thanks to a generous contribution from the family of alumnus Sydney Acker. The donation is in honour of Mr. Acker’s successful engineering career, his immense interest in concrete and his passion for research. The Acker laboratory will provide the Concrete Materials Research Group, led by civil engineering professor Michael Thomas, with a separate space for testing and specimen preparation, as well as new equipment for research. His students will utilize the new laboratory to continue their work on important concrete-related research projects, including the creation of cement with a low carbon footprint and finding ways to reduce the effects of salt on concrete. The laboratory will increase UNB’s position in the field of civil engineering and allow the department to solidify its position as an industry leader. The contribution from Mr. Acker also allowed UNB to leverage additional funding from the Government of Canada through the Canada Foundation for Innovation and the New Brunswick Innovation Foundation, thereby more than doubling the resources available for the laboratory and new equipment. In addition to the new laboratory, Mr. Acker and his family have established the Sydney Acker Scholarship, a $4,000 annual award for engineering students from any discipline. Born in St. Stephen, N.B, Mr. Acker – a pioneer in precast and prestressed concrete – was a hard worker with a modest demeanour. After graduating from UNB’s bachelor of science in civil engineering program in 1944, Mr. Acker entered the Royal Canadian Engineers as a lieutenant and started a lifelong career in engineering and construction. After leaving the army, he spent 17 years working across the country for the engineering firm Creaghan & Archbald. In 1964, he joined the ranks of L. E. Shaw Limited, known today as The Shaw Group, where he built and managed their concrete operations. He spent the remainder of his career at Shaw, eventually retiring as Chairman of the Board in 1989. Mr. Acker was also a prolific painter, a sculptor, a devoted father and a loving husband. Sadly, in 2006, Sydney lost his courageous battle with cancer; the industry lost a leader and an advocate, and UNB lost a good friend.